I am looking for the correct email address to send documents to Sheffield for a UK visa application. I have been asked to submit my criminal record certificate which I had already scanned at visa center. I am from India. I have sent an email to the provided address but have gotten no acknowledgment. I was reading this post where someone mentioned he had the same email address but when he sent documents to that address he got no reply. He was asked again and again and finally his visa was rejected. Then in administrative review, he was told that it was their mistake because email address they provided was wrong. In my case, I have received the same email address. I am worried and stressed after reading that post. hope it shows. I m not able to upload previously. Not the answer you're looking for? Browse other questions tagged united-kingdom indian-citizens uk-visitor-visa or ask your own question. 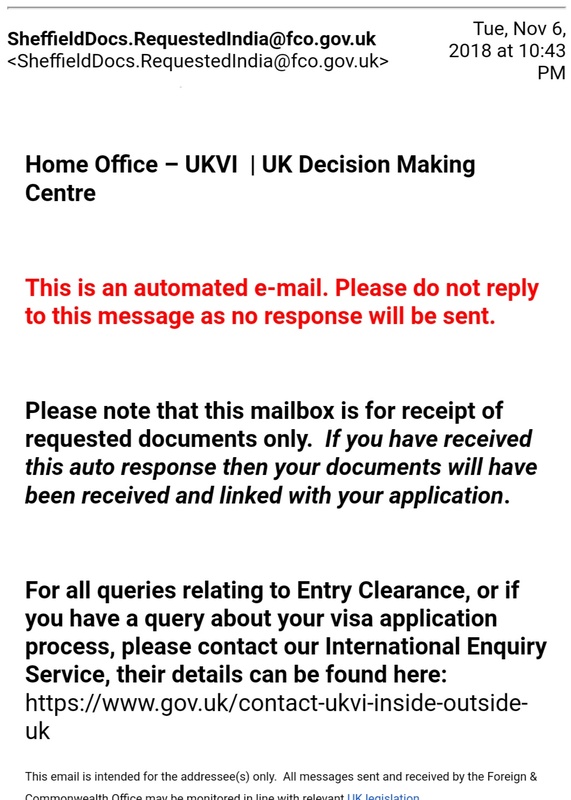 My UK Tier 2 visa was refused, the visa office states I did not send a letter from UK NARIC, but I did. What should I do? Can I still get my degree when my tier 4 visa extension application refused? Would staying as a guest at a friend's affect my visa?